Good evening everyone, or good whatever time of day it happens to be when you read this! I went to see my Ortho today to get my next few sets of aligners. She put in the 25th set today, which means, if you can count, that there are 13 more trays to go until I am finished! The ortho also said that everything looked “excellent” and that my teeth are tracking exactly as they should be. I took that as great news and I’m super excited! She also checked my bite, as per usual, and said it too looked “excellent”. Little did she know, I haven’t been as dedicated to my elastics as I should be…shhhh…. Oh well, I can’t wait for this to be over! They also set me up with more aligners, up to set 29. And at that point, I’ll be down to 9 trays! NINE! I’m always jealous of my boyfriends perfect teeth and I can’t wait until mine too are all nice and straight! I guess now that we’re nearing August and the end of summer I should be doing back to school shopping. But I can’t bring myself to do it. I’ve begun budgeting and looking for a job for when I’m back at school so that I can stop relying on my parents so much and wouldn’t need to come home for the summer…the “adult” life as it’s called. No leads on jobs yet though, unless I want to babysit or do retail…but with a bachelor’s degree, that’s just not something I want to do. I want to be on my way to a career, not just doing jobs that bring in a small amount of money. But if it comes down to that, I’ll take anything. That’s all I have to report! Stay tuned for updates! hey! I’m thinking of getting invisalign too – just wondering why you decided to go with that instead of the behind the teeth braces? Hey! I did a lot of research in the different types of braces out there. For me, I thought the behind the teeth braces (I assume you mean these…http://media.tumblr.com/tumblr_lzgmakNghJ1r7aw5u.jpg) didn’t look comfortable. I thought it would be difficult to bite down, a lot of food would get stuck in between them, and I would cut up my tongue because I would always play with them. I considered regular braces, but I obviously didn’t want to be the 22 year old with braces. Actually, the biggest factor for me was that my orthodontist is near my home town, and I go to school 6 hours away. 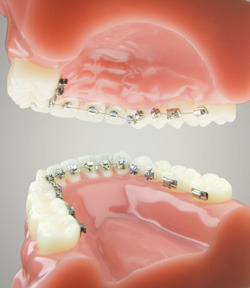 So I would not be able to come in for adjustments with braces as often as they wanted. With invisalign, you just put the new trays in, and I see the ortho about every 10 weeks (which works out nice because it’s usually around a holiday so I’m home). Hope that helps! This whole getting braces decision is killing me! Killign me I tell you! Definitely shop around when you’re getting any form of treatment. Either way you go, it’ll be a big investment. My ortho first gave me a giant estimate. It freaked me out because the prices I’ve usually seen were about $1000 less. So I went to another dentist who did invisalign and they gave me an estimate that was $1800 less. They called my ortho for the xrays they took, my ortho called me right after and said if price was an issue they would drop it down by $1500. So yeah, shop around and let them know you’re doing it. Other ortho’s I went to also asked what some of the estimates were. When they asked, they usually priced their own lower by about $100. Oh forgot to say – thanks for answering my question. You’ve been really helpful! Hi there, hope you’re enjoying summer vacation! I’m just reaching out to braces bloggers now as we’re trying to compile a resource of stories of people who’ve gone through the process. Was wondering if we could interview you for our site?